With a rusty-looking metal exoskeleton crisscrossing over a glass and metal base for one building and a glass-and-metal design mimicking the shape of bricks on a wall across the street, the Atlantic Plumbing condos in Northwest Washington were a unique vision of futuristic, industrial design in the city. Then came Westlight at 23rd and L streets NW, the luxurious project from developer EastBanc. When the high-end 71-unit condo building opened for sales in November, a line of campers settled around the block to wait for hours for the opportunity to sign a contract to live in the glassy creation, designed by Mexico-based architect Enrique Norten and opening later this spring. And just a few weeks ago, another modern residential project designed by an out-of-towner debuted. When Ditto Residential finished its most recent condo project on the 1500 block of 6th Street NW, designed in a glassy, breezy style by Chicago-based architect Brad Lynch of firm Brininstool + Lynch, developers were stunned by how quickly buyers snapped them up. “What we’re seeing is a real appetite for avant-garde and contemporary, modern spaces. We’ve predicted for years that people would start to demand exceptional design, and I think we’ve arrived at that moment,” said Ditto. Principals at JBG concur. The behemoth development firm, responsible for countless residential projects throughout Washington, is going on more than a hunch. According to JBG partner Kai Reynolds, the firm holds numerous focus groups in neighborhoods where they have plans for a development. In historic Washington, a residential development boom from more than a century ago dictates the look of much of the residential architecture. Walking around Shaw, said Reynolds, “every single building is a 2½ -story brick rowhouse that was built in the early 1900s.” The early 1900s were a boom time in Washington, when prolific developer Harry Wardman built out neighborhoods such as Bloomingdale, Columbia Heights and Woodley Park with hundreds of rowhouses and dozens of apartment buildings and hotels. Brick abounds. Now that another development boom is underway, developers are starting to realize that contemporary designs are appealing to some high-end buyers more than recreations of the past. For inspiration, the JBG developers embark on field trips to cities that have evolved more quickly or differently than Washington, Reynolds and Coulter said, including Los Angeles, Seattle, New York, Vancouver, Toronto and London. On a trip to Seattle, they found Miller Hull, the Seattle-based architects they eventually tapped to design the Shay, a modern project at 9th and U streets NW. When envisioning the Atlantic Plumbing project, Reynolds felt that the area north of U Street could be similar to the Meatpacking District in New York City. Ditto similarly brought in Lynch, whose 6th Street project was his first in Washington. Lynch’s firm was established in Chicago in 1989, and is inspired by a “Chicago-style” architecture established by 20th-century Chicago modernists such as Ludwig Mies van der Rohe and Frank Lloyd Wright. Materials such as glass and metal are more expensive to use than masonry, and the prices reveal the cost of construction: At Atlantic Plumbing, condos ranged from the upper $300,000s to $1.9 million; at Westlight, from $625,000 to $4.4 million; and at Ditto’s 6th Street project, from $995,000 to $1,249,000. With the price per square foot at the top of the market, the modern units are sometimes smaller, and the abundance of light helps the spaces feel open. Lindsay Reishman, an agent and senior vice president at Compass, brought several clients to Westlight. “One client was looking at the penthouse, and the price came out to $1,500 per square foot — I told them, I can’t point to a comparable sale,” Reishman said. In looking at recent sale numbers in Washington, Reishman points out that 60 percent of the condo sales of more than $1 million in the 20001 Zip code — which covers much of Shaw, the U Street neighborhood near Atlantic Plumbing, and stretches to Columbia Heights — classify as modern. A few years ago, modern buildings had a harder time finding buyers to meet their higher price point. The Lacey, for example, is a glassy, modern condo project that went up on 11th Street NW in 2009. Though the design won awards, the developers needed to go through several waves of price reductions before selling all the units. Georgetown’s 22 West was another pioneer in the modern residential world. The glass condo building, designed by Washington’s Shalom Baranes for EastBanc, went up in 2008. At the time, said Watts Venners, the project presented the community with something new and boggled some minds. The experience inside of these modern units is a major draw, agrees Reynolds. For Amanda Skura, a resident at Atlantic Plumbing, the modern architecture was a big reason for seeking a home there. Living in the streamlined unit also necessitated overhauling her furnishings. Before, Skura was drawn to cozy, puffy “Pottery Barn-style” furniture; in her new place, the cushy style didn’t quite work. “The pieces felt so oversized,” she said. “I was in over my head.” Skura found an interior designer, Stacy Wallace, who specializes in working in contemporary spaces, to help her out. Wallace added, “There is some competition from up-and-comers [in the modern interior design space], but not a lot of competition from the big-name established designers here,” who still focus on traditional styles. As the modern trend marches on, some detractors exist. 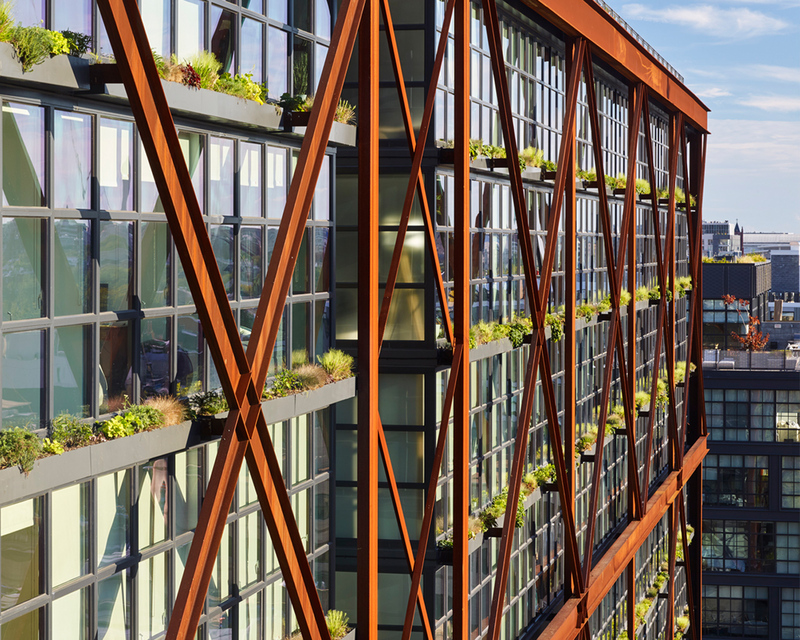 When D.C.-based architect Eric Colbert first presented a modern glass-and-steel design for an apartment building at 5333 Connecticut Ave. in 2013, the neighbors balked. Neighbors, most of whom lived in single-family homes, filed several lawsuits to try to stop construction, even creating a group, the 5333 Connecticut Neighborhood Commission, whose purpose was to oppose the project. But after meeting with the area neighborhood commission several times and making a few tweaks, Colbert ultimately sold the community on the new design, and the building opened to residents in 2016. “It’s an incredibly contemporary design, and we’re very proud,” said Colbert. Colbert is in the midst of Washington’s modern construction boom. While Morris Adjmi drew the initial designs of Atlantic Plumbing, Colbert was hired as the architect on the ground, finalizing drawings and construction plans and seeing the project through to the end. Colbert also designed the Highline, a 315-unit apartment building near Union Market at 320 Florida Ave., which recently broke ground. The industrial design, with modern materials, was inspired by the nearby railroad tracks and warehouse district. JBG officials say they have another project in the works that they hope will generate as much discussion as Atlantic Plumbing did. West Half Street, near Nationals Park, is a cantilevered wavelike glass construction. Similar in design to Westlight, though much larger, the 216-unit project will deliver in 2019. For that project, JBG tapped ODA Architecture, another New York-based firm, which specializes in organic-looking modern designs, with greenery bursting out of glass projections. Like Westlight, the jutting design of the units will allow many more residents a corner view.